There’s no better feeling than paying off debt that’s been dragging you down for years. After months of planning, budgeting, and making smart financial decisions, you’ve finally paid off those pesky loans and credit cards that have kept you in a financial hole and negatively impacted your credit score. Once you make that final debt payment, you feel a sense of freedom, and you’d expect that nothing but good things can come out of being debt free. But, paying off your debt doesn't necessarily increase your credit score. In fact, in some instances, paying off your debt can cause your credit score to drop. Here’s what you need to know about paying off debt and how it impacts your credit standing. You've stuck to your plan to get out of debt and now your dream of being debt free has become a reality. So why have you been rewarded with a lowered credit score, even though you’ve made a huge financial achievement? To understand your credit score, you must understand the factors that impact it. Making payments on time is the biggest factor that affects your credit score. The second most important factor is how much of your credit you're using, also known as credit utilization. After paying off your debt, this is the factor that generally causes your credit score to drop. Keeping your credit utilization at 30% or below is good and will benefit your credit score. But, having no credit utilization, which happens when you pay off all of your debt, can cause a drop in your score. As you pay off student loans, a car loan, or even a credit card, not only do you lower your credit utilization, but you also have a lowered number of accounts. This too can have a negative impact on your credit score. But, a small decrease on your credit score isn’t nearly as problematic as thousands of dollars in debt. Being debt free is a much better financial decision than worrying about a small impact to your credit score, so don’t let a drop keep you from meeting your goal is becoming debt free. If you’re still working towards paying off debt, there are some tips and tricks to follow so that you can minimize your debt balance without negatively affecting your credit score. 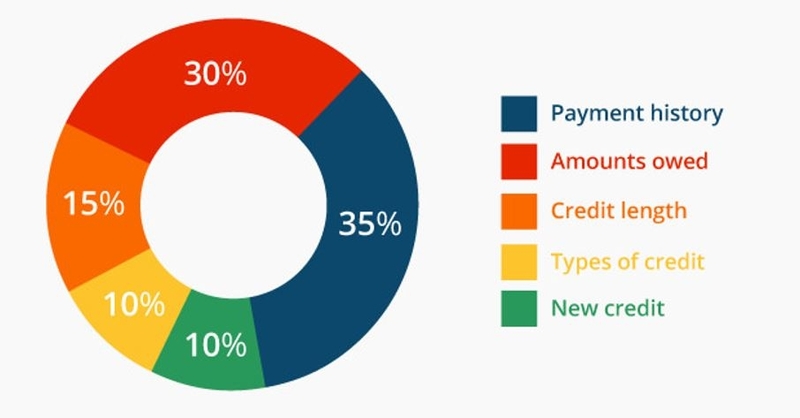 Your credit utilization is determined on a per-card and overall balance. In your quest to lower your debt, it pays to know which debt to pay off first. If you have credit cards that are nearly maxed out or are well above 30% utilization, you want to pay off those debts immediately. The quicker you lower your credit utilization, the better your credit score will be. Another important habit to maintain or improve your credit score while paying off debt is to always pay on time. Late payments not only come with a fee, but they can also seriously damage your credit score. Late payments also reflect badly when creditors look at your credit habits on future credit applications. Aside from paying on time, it’s also important to try to pay more than the minimum balance on at least one of your debts. To determine which debt to pay off first, prioritize based on total debt amount or on the interest rate. Some use the snowball method of paying off their smallest debt first while others prefer to tackle their highest interest rate debt. By following these steps, you can not only pay off your debt, you can also have the peace of mind that your credit score won’t be negatively impacted. The most important thing you can do when paying off debt and managing your credit score is to be patient. Your credit score is updated on a daily basis and activity that you make within a set timeframe aren’t immediately reflected in your credit score. If your credit score has dropped, be patient and continue to practice smart financial choices. In time your credit score will increase. The key is patience and consistency. Sometimes good financial decisions have bad and unintentional outcomes. When paying off your debt, be aware that your credit score may drop. However, there are ways to minimize the negative impact so that you remain in good credit standing while working to become debt free.